Perfect for game time or anytime, these Garlic Ranch Pretzels are sure to be a snack-time winner. 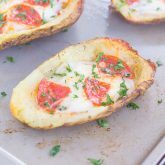 Baked with ranch dressing and hints of garlic, you’ll be making this salty snack over and over again! Hockey season is officially over in my neck of the woods. That’s right, the Chicago Blackhawks were finally defeated, just one game shy of continuing on for the championship series. And while I’m a proud Chicago fan, I am just the teensiest bit happy that there’s no more Chicago hockey until next season. Dare I even say that out loud? Ok it’s out there, no going back now. You see, I’m not really a big sports fan. I love going to sporting events, especially basketball games (Go Bulls) and the Chicago Cubs, but put me in front of a TV, and it’s a snooze fest for me. In fact, if we are staying in on a Friday night, it has become a tradition for me to fall asleep on the couch while the hubster is eagerly watching some sporting event on TV. The boring chatter and sports lingo that make absolutely no sense to me just lulls me to sleep. Sorry to all you sports fans out there, but I just don’t get it! Now the hubster loves sports. And love is probably an understatement. Football, basketball, hockey, baseball, tennis, you name it…he’s on top of it and knows exactly what’s going on. He religiously checks for updates on the ESPN website, reads Sports Illustrated magazine, and watches (and records) a bazillion sports shows on TV. I always tease him that he missed his calling in life and should’ve been a sports caster on TV or the radio, because he knows practically everything there is to know about sports. So you could say that the hubster and I are pretty opposite when it comes to sports. And you know what? I’m totally fine with that. As much as I try, watching sports (especially football and hockey) will never be enjoyable to me (unless it’s the NCAA for college basketball). But the one thing the hubster and I both share a love of are these Garlic Ranch Pretzels. Because I’m a dutiful wife that supports the hubster’s sport-watching habits, I decided to make him the perfect game-time snack. 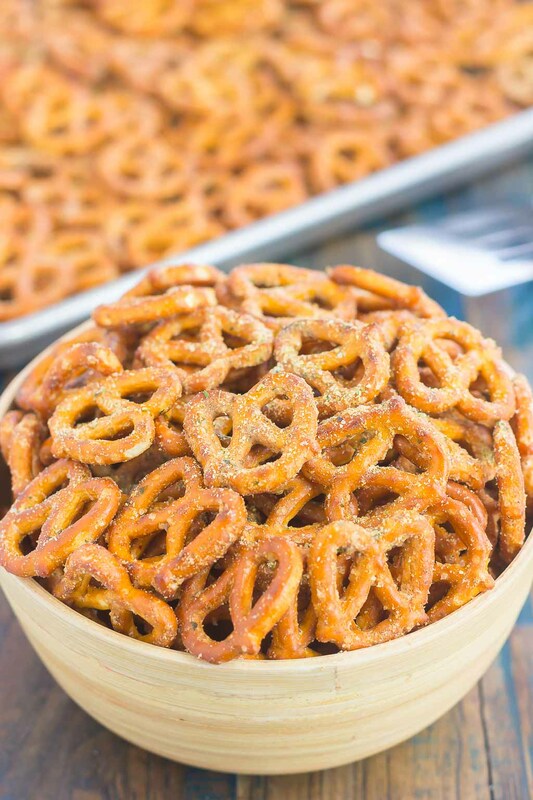 Baked with a combination of spices, these pretzels are sure to be a winner in your house! And the best part? They are SO easy to make! And not only that, but they are addicting, too. I had to purposely give the hubster a bowl of these and ask him not to share with me, because I have no will-power when it comes to salty snacks. 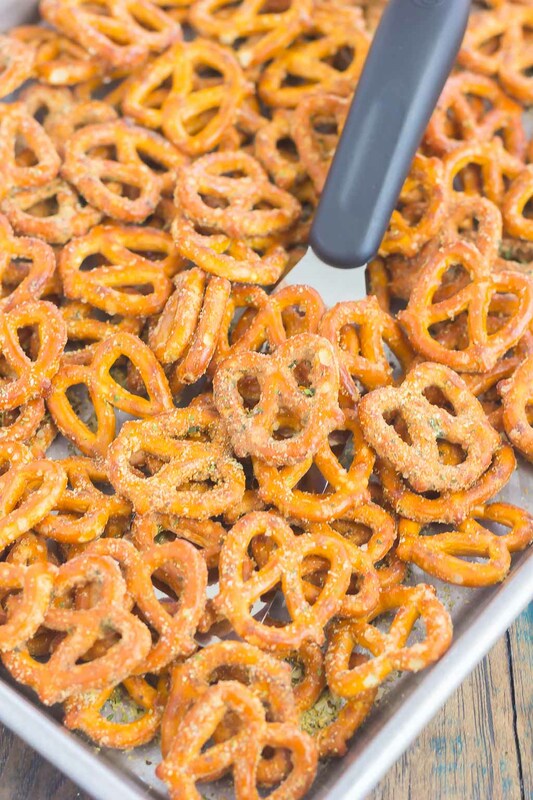 And these are the ultimate pretzels for all you salty snackers out there! I love cookies and brownies, but I will take salty over sweet any day! 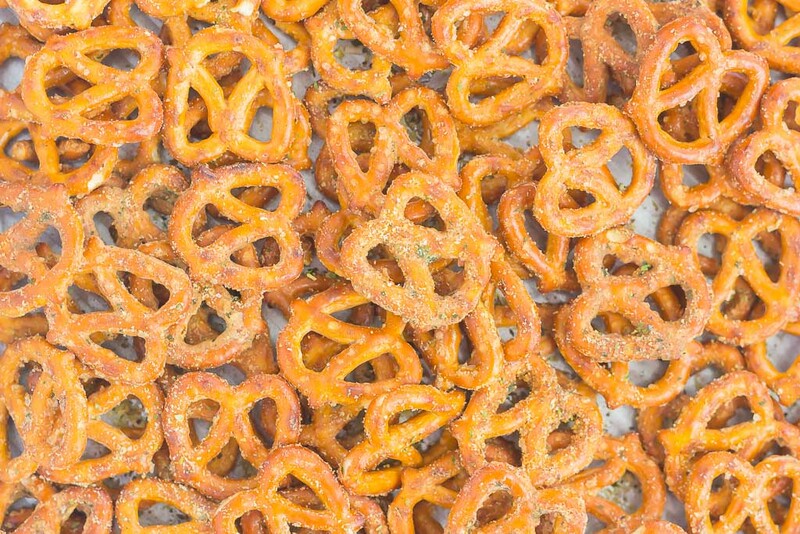 To make these irresistible Garlic Ranch Pretzels, start with your favorite kind of pretzel. For me, it’s Rold Gold’s tiny twists. I just love the buttery-ness of them! But if you prefer a different brand, pretzel rods, etc., feel free to swap those in. I used a large, freezer ziplock bag and first combined all of the ingredients, sealed the bag again, and shook so that the oil mixture coated each pretzel. Once that was done, I spread the pretzels out onto two baking trays and baked in the oven for about 15 minutes. And let me tell you, these Garlic Ranch Pretzels smelled amazing when they were baking! I am a Ranch dressing girl at heart and couldn’t wait to taste these babies! As soon as the pretzels were out of the oven, I had to sneak two or three (ok, six or seven), just to make sure they turned out alright. The flavor combination was perfect! The ranch dressing provided a subtle ranch flavor, not too strong, and combined well with the garlic powder. 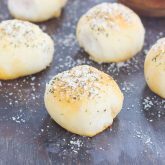 These are easy to make for a tasty snack and would be perfect served with an ice cold glass of pop! 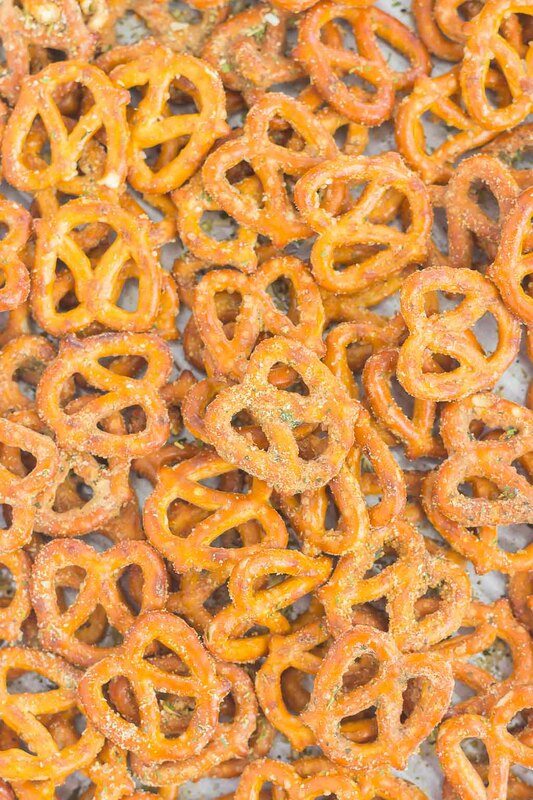 For me, it’s Diet Cherry Dr. Pepper, mmmm…..perfect with these Garlic Ranch Pretzels! So the next time you want to impress the sports fan in your life or need to bring a snack to a party, try these Garlic Ranch Pretzels! I guarantee you will be making these for a salty snack more than once! Perfect for game time or anytime, these Garlic Ranch Pretzels are sure to be a snack-time winner. 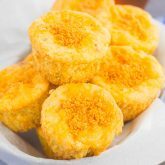 Baked with ranch dressing and hints of garlic, you'll be making this salty snack over and over again! Preheat oven to 300F. Line two baking trays with silpat mat or parchment paper for easy clean-up. In a large ziplock bag, add pretzels, olive oil, Ranch dressing mix, and garlic powder. Shake gently until oil mixture evenly coats pretzels. 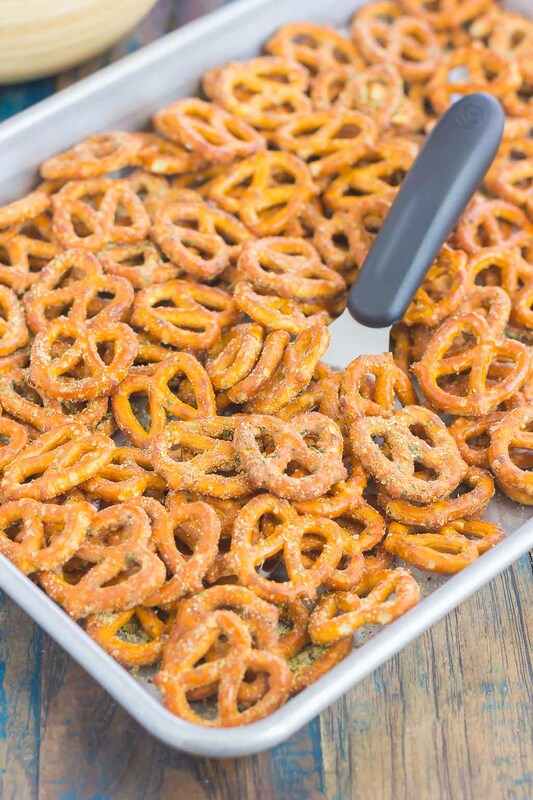 Spread pretzels in an even layer on baking trays. Store pretzels in an airtight container at room temperature for up to three weeks. Pretzels will keep in an airtight container for up to three weeks. These pretzels are so easy to whip, I think you will love them! I know what I'm making next time we have a get together! I love ranch and pretzels so this would be perfect. Wonderful recipe Gayle! Thanks, Danielle! Definitely a perfect snack for a get together. Hope you enjoy! My Dad is a big sports person, too, and I have to say, it has rubbed off on most of us! College basketball is one of my favorites, too. As are pretzels! 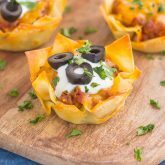 This is a delicious twist on the classic snack! Pinning! My dad is a big sports fan too, but it must've passed me up somehow! :) Thanks for the pin, Mary Frances! These might just become my new favorite snack! YUM! Thanks, Pamela! These pretzels are addicting! Luckily my husband is nice and let's me watch TV too...and the fact that I can go into another room and watch TV helps! :) Thanks, Natalie! A quick and easy snack! Isn't ranch the best? I sometimes dip my pizza in it, I love it SO much! Hope you enjoy, Katie! Thanks, Marcie! This take the ordinary pretzel and makes it extraordinary! My dad was so sad that Montreal was knocked out of the Stanley Cup playoffs! Love pretzels, and these look super yummy! I know the feeling, Denise! I think my whole family was upset about the Hawks! And thanks for the compliments! Sounds like my husband. He has to know all the scores for every sport. I'll go to a game because I like to people watch, but I never watch sports on TV. I'd sure eat a bunch of these pretzels though. Love Ranch flavoring! Glad you can relate to my sports-loving husband, Christin! I do love to people watch at sporting events, too! And the ranch flavoring gives these pretzels a nice touch! I'm not sure I could get the ranch powder stuff over here, but I love the idea and I suppose could sub in something else very easily. It's a great idea to make your own flavoured snacks, Gayle! Perfect timing for Soccer World Cup preparation! Thanks, Helen! If you don't have ranch powder, I'm sure you could use garlic powder, oregano, basil, etc. in its place to make seasoned pretzels. Thanks for the compliments, Kloe! So glad you found my blog! :) Ranch and pretzels are definitely the perfect combination! I am not a fan of watching sports either - but I could be a fan of these pretzels! Yum!! These are the BEST pretzels! Hope you enjoy! Love the idea and the pictures are gorgeous! These need to happen asap! Such a great snack! Thanks for the pretzel love, Mira! Can not wait to get these as pretzels as they van be a bit boring at times and the ranch flavor is a favorite and I think the combo would be amazing. Got all the ingredients and ready to start. I'm so glad to hear that, Cheryl! I hope you love these pretzels! Thanks for stopping by!